Iran's hardline Judiciary Chief Ayatollah Sadeq Amoli Larijani has defended the actions of a police officer who beat a young woman in Tehran last week for "insufficient hijab". In his regular Monday address April 23, Larijani said "No one should be allowed to resist a lawful action by the police, or to insult a law enforcement officer." Iran's morality police enforce the dress code for women in the Islamic Republic, and have been criticized in the past for their harsh tactics. Nevertheless, Larijani said that "the police should not take even one step back, otherwise, the society's order, the police's authority, and the country's security would be compromised." "It is unacceptable that some people resist the police and politicize a cultural or social matter," Larijani said. 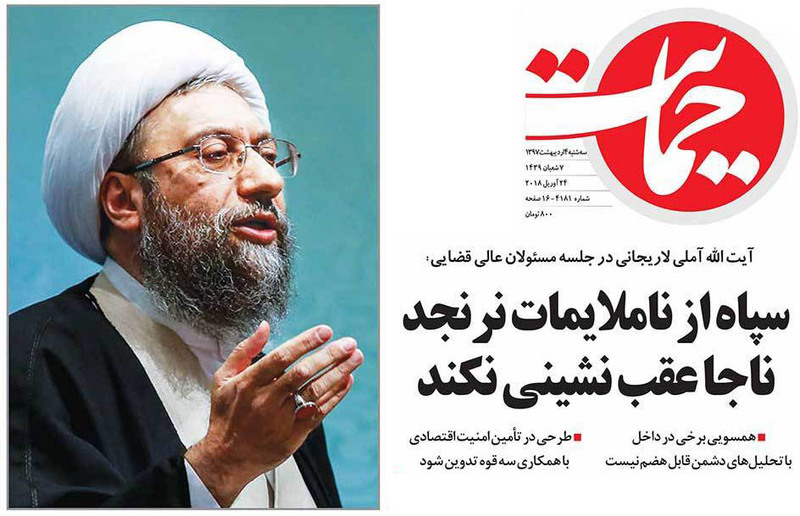 Larijani's remarks can be seen as clearly linking the security and even survival of the regime with compulsory hijab. If people can resist the dress code and challenge the police, this can lead to wider disobedience and threaten a system built on use of force and interference in all kinds of private matters. Tehran MP Tayebeh Siavashi has described the incident as "regrettable," and Deputy Police Chief for Parliamentary Affairs Hamid Reza Eshraq has said the policewoman's behavior was a "mistake," adding that the morality police "have been told to let the suspects go if they resist. Interior Minister Abdolreza Rahmani Fazli has ordered an investigation into the case, but also called on women "to observe Islamic standards," meaning to wear the hijab. MP Parvaneh Salahshouri, head of the women's faction, is demanding a large-scale investigation into the actions of the morality police over the last 13 years. Last Friday, Ahmad Alamolhoda, firebrand Friday prayer leader for the city of Mashad, criticized officials and MPs who supported the young woman. Meanwhile, hardline daily Kayhan and Islamic Revolutionary Guards Corps-linked news agency Fars wrote that the incident was "pre-planned" and "fabricated." Turning to the war in Syria later in his Monday speech, Larijani insisted no one should question Iran's "advisory presence" in Syria. Iran's intervention in Syria has been widely criticized in Iran and abroad during recent months. Thousands of farmers protesting the mismanagement of water resources in the central province of Isfahan also chanted slogans against Iran's military presence in Syria last week, as did millions of demonstrators in over 100 Iranian cities and small towns in January.